Paired with a 2-ingredient Chocolate Caramel Latte, these easy, lactose free, 4-Ingredient Chocolate Caramel Truffles make a delicious breakfast as they are, or, coat them in chocolate for a delightful afternoon treat or dessert. Last week, spring was in full blast here in Georgia. There were even a few days when the mercury soared into the 80s and I thought our spring was short-lived as summer was on the horizon! For this heat-lover, those days were exquisite! Those days, I left my two coats at home and went around with no coats. 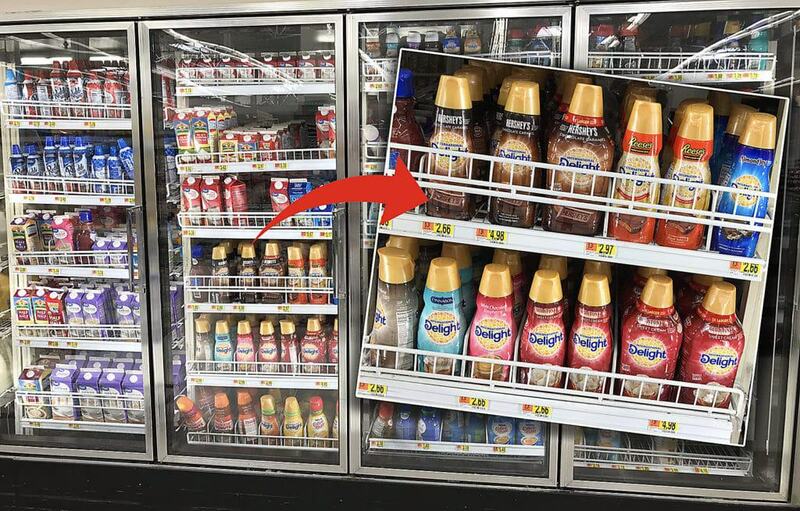 Those days, I stopped by Walmart and stocked up on crispy salads and some of my favorite International Delight® creamers like the International Delight® HERSHEY’S® Chocolate Caramel creamer and International Delight® Almond JoyTM creamer. By the way, you can Save on your favorite International Delight® flavors using this iBotta offer. Also, make sure to look for the in-store display that includes a tearpad with a recipe and $0.50 coupon valid in April, when you are at your neighborhood Walmart. Last summer, I shared this Decadent Frozen Hot Chocolate Caramel Cream Frappe made with frozen International Delight® HERSHEY’S® Chocolate Caramel. 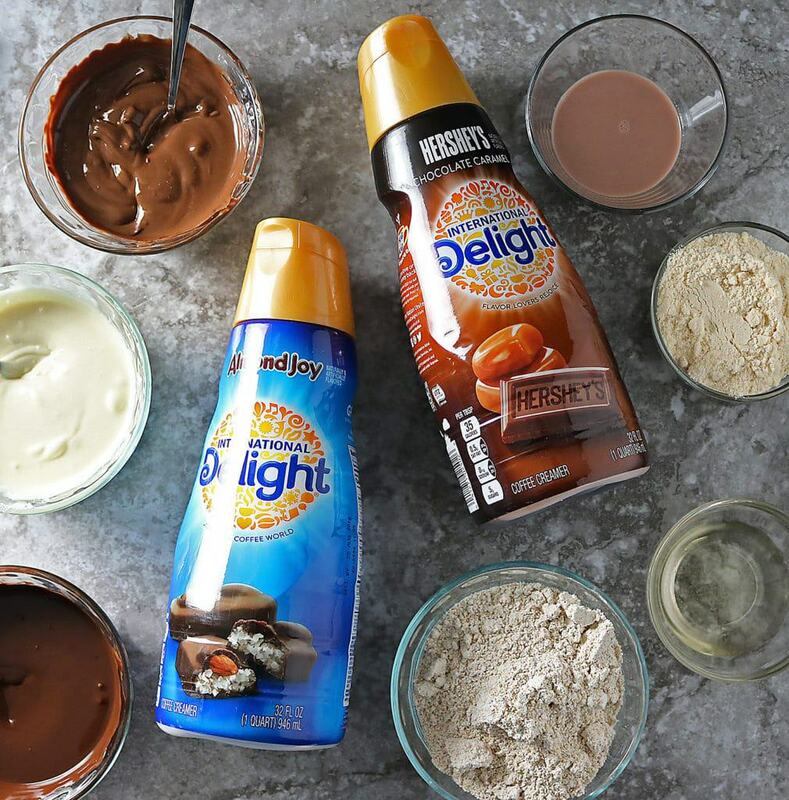 And, this weekend I planned to make several more different flavored frappes using International Delight® creamers as well as some no bake truffles or bites. Alas, the weather here in Georgia is predictably unpredictable. Over this weekend, our highs fell from the 80s into the 50s. Too cold for a frappe – for me. But, definitely NOT too cold for a Chocolate Caramel Latte and some no bake, 4-ingredient Chocolate Caramel Truffles! 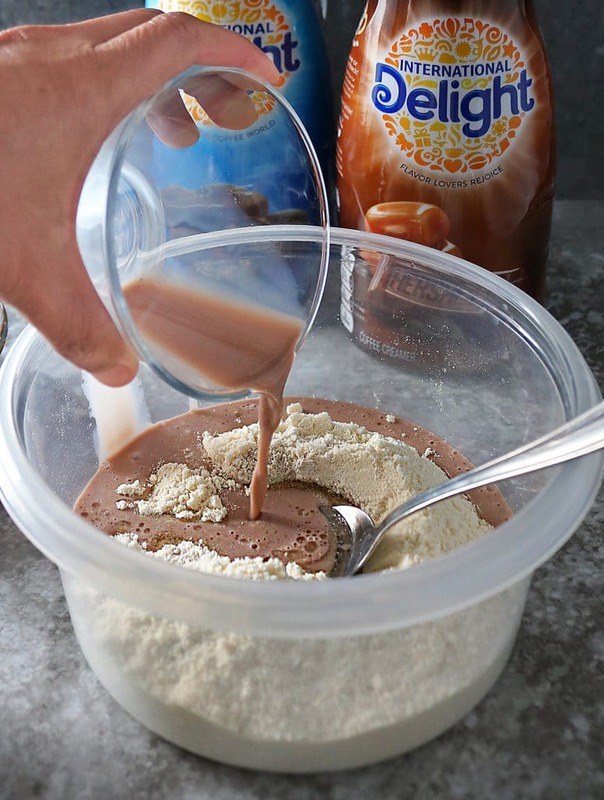 For the longest time, I have so enjoyed lactose free, International Delight® creamers in my morning latte or cup of coffee. And, I have also enjoyed International Delight® creamers in breakfast treats like these cinnamon rolls and this chia pudding. Today, I have a super easy, 2-ingredient, Chocolate Caramel Latte as well as these easy, no bake, 4-ingredient Chocolate Caramel Truffles to share with y’all. The Chocolate Caramel Latte involved some elbow grease in frothing up some International Delight® HERSHEY’S® Chocolate Caramel creamer which was then added to a steaming mug of brewed coffee. For this Chocolate Caramel Truffle recipe, the coconut oil needs to be melted and the International Delight® HERSHEY’S® Chocolate Caramel creamer needs to be very slightly warm. This way it is easier to mix up the truffles without the mixture becoming too hard and crumbly (yes, that was my first attempt). 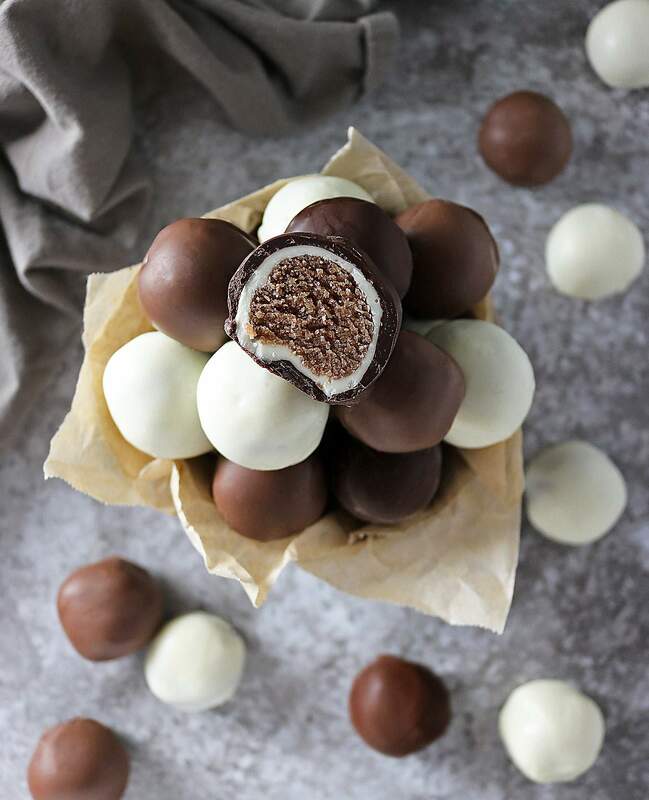 I chose to make these truffles a bit more indulgent and fun by dunking them in melted semi-sweet, milk, and white chocolate. There were even a few I double dipped in white and dark chocolate, but I didn’t get to taste those as my daughter managed to find and finish them off. 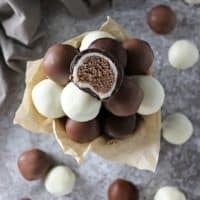 Whether you chose to enjoy these with a cold frappe or a warm latte (depending on the weather in your neck of the woods), I hope you give these easy Chocolate Caramel Truffles a try soon! Visit International Delight®‘s Pinterest page to find recipe inspiration for delicious, seasonal treats. 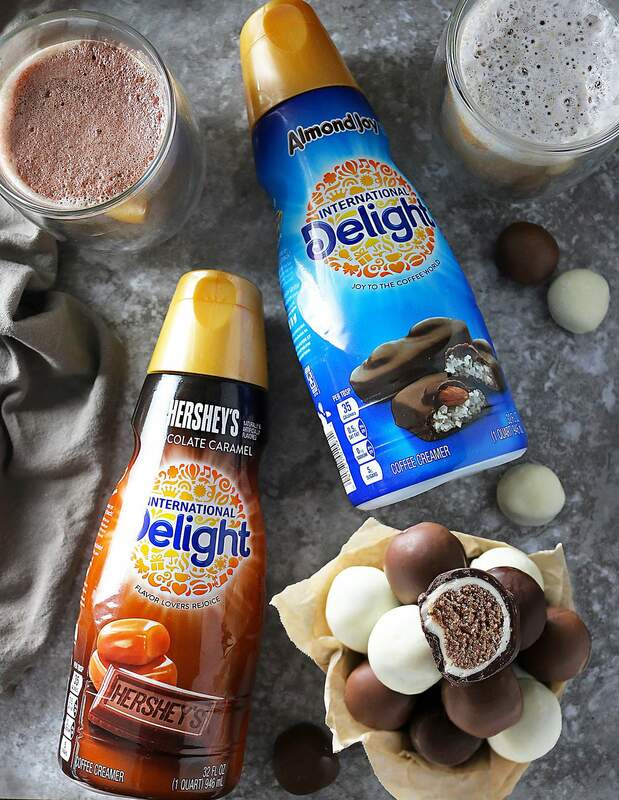 You can also find ideas on their social hub here with the following creamers: International Delight® HERSHEY’S® Chocolate Caramel, International Delight® REESE’S® Peanut Butter Cup and International Delight® Almond Joy™! You could also check them out on Facebook, Instagram, Pinterest, Twitter, and Youtube. Paired with a Chocolate Caramel Latte, these easy, lactose free, 4-Ingredient Chocolate Caramel Truffles make a delicious breakfast as they are, or, coat them in chocolate for a delightful afternoon treat or dessert. Place the ground up rolled oats in a bowl along with the coconut flour. Make sure to warm up the coconut oil before measuring it. I heated up the glass container of coconut oil till it was melted, then took 3 tablespoons from it to add to the oats and coconut flour. Add the International Delight® HERSHEY’S® Chocolate Caramel creamer to a microwave safe cup and heat for 20 seconds or till slightly warm. Then add this to the bowl with the oats, coconut flour and coconut oil, and mix well. Set mixture aside till it cools a bit. Then, take spoonfuls and roll them into balls. Melt the white, milk and dark chocolate (I added the different chocolates to 3 different bowls and microwaved them on 2 - 30 second intervals. When melted, roll the truffles in either of the chocolates and set on parchment paper to set. If you'd like it glazy, then don't place them in the fridge to set - let them stay on the counter till the chocolate has hardened. These Chocolate Caramel truffles can be stored for about 4-5 days in an airtight container in the fridge. 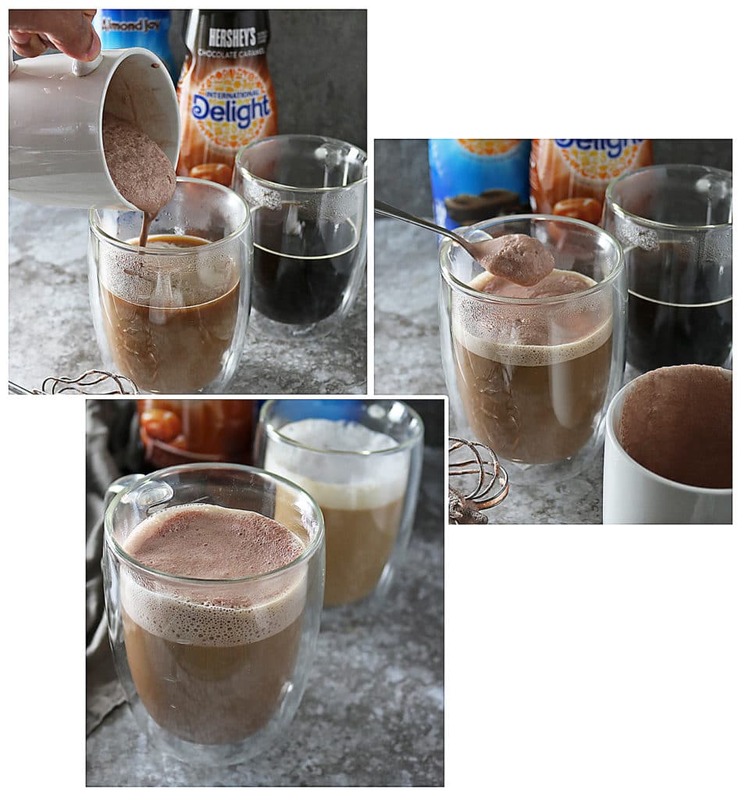 Using a frother, froth the International Delight® HERSHEY’S® Chocolate Caramel creamer. Then, pour into the coffee and spoon the froth onto the top and it is ready to enjoy! These truffles look so good! I love the double coating – so cute and unique! These chocolate caramel truffles look really awesome Shashi I am planning to make it for my Daughter’s Birthday. Thanks for sharing this lovely recipe. Pinning for sure!!! Oh my greatness! These look simply amazing! The double dipped ones look amazing. Love it. How fun! 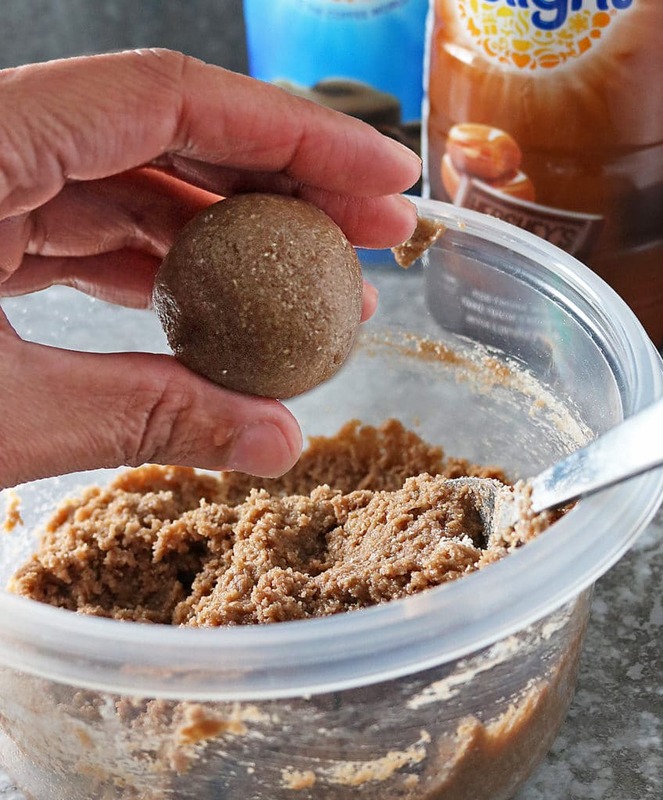 I love how you used the chocolate caramel creamer to make these truffles. I could really use a warm latte today. It has been unseasonably cold here. Oh these truffles look fantastic Shashi – love their texture. I wouldn’t have thought of using some coffee creamer for making sweets. They look so much better than the store bought!